All Richmond referees should familiarize themselves with the 2017/2018 Handbook. It is recommended that you print out a copy and keep it with you at all times. The following general information is important for all officials, both the Referee and the Assistant Referees to know prior to officiating for RSA in 2017/18 and beyond. It is a good idea to have a copy of this document with you at all your matches along with a current copy of the Small Sided Game rules and the LOTG provided by the BCSA. Weekend assignments will normally be released by Wednesday evening for the upcoming weekend. You must either accept or decline that game within 24 hours or it will be returned and reassigned to another Referee. If you have availability issues and need to block time off, please log in to Scheduler and book off the appropriate time. Do not wait for games to be assigned and the decline them. If there is a consistent pattern that develops with declining games when times are not scheduled off, you will be moved lower in priority for assignments. It is up to you to be responsible and control your schedule and availability. All assignments are distributed and confirmed via Scheduler, and reminders will be sent to all officials the night before to remind them of their weekend’s matches. Match officials must be in good standing and currently registered through BC Soccer to receive assignments. Please refer to the Referee Schedule instructions for more information on the scheduling system. All games will be assigned based on referee ability and availability. The new system will see each Referee assigned with a score that reflects their ability to do a game at that level and below. For example, if you are given a score of 4, you can do games that are at a level of 4 and below. As an AR, the same scoring system will apply. These scores are affected by your on field performances, Mentor feedback, Coach’s feedback forms, and monthly video sessions. Your schedule for any given weekend can be viewed by logging into Scheduler. The Head Referee will also have a master copy of all officials’ matches for the weekend. All teams should be at the field 30 minutes prior to the Kickoff. As an official you should report for your match at least 30 minutes prior to kick off to make sure the game starts on time and you can administer all the administration (Law 1, Law 2, Law4). Checking of ID cards and players’ equipment (Law 4) should be done at least 15-20 minutes prior to kickoff. It is recommended (but not required) that you warmup prior to the match. Games above are out players + GK’s if indicated with a YES in that column. 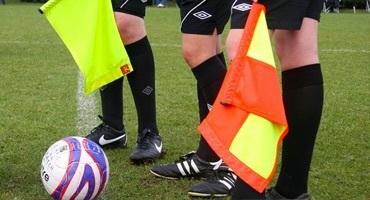 All levels (U9 – U18 House, Gold, Silver, MSL) are unlimited substitutions at the discretion of the Referee to control as to when they happen. All Substitutes are to remain on the sidelines in pinnies that distinguish them from the players on the field. When a substitution is requested, they need to be ready to go so that the game can continue as quickly as possible. If a request is made and the team or player is not ready for the change, then continue on with play and do not signal for the Substitution. To replace a player with a substitute there must be a stoppage in play and the referee must be informed and give a signal prior to the change taking place. The player only enters the field of play after the player being replaced has left the field and after receiving a signal by the referee. The substituted player may leave the field from any boundary line. Players should exchange pinnies to make it easier to recognize the change. In the case that matches need to be cancelled, match officials will have no match fees owing to them if they receive email or telephone notification of field closures by 8am the day of their scheduled match. If a match official receives no prior notification of a match cancellation, and upon arrival at the field declares or realizes the match is not playable for any reason, they will receive 50% of their match fees. Any club assigned games will be paid via cheque once a month after the month has ended. Small Sided Games: All players and coaches must present their Player /Staff ID card to the referee prior to the match. Small sided players will not have cards, but as of April 2014, all coaches and technical staff that want to remain on the field will need cards. If a coach does not have a card, they cannot be present on the sidelines as per BCSA rules and regulations governing the sport of Soccer in BC. Full Sized Games: If the player does not on have a card, that individual will not be eligible for the match. A player is not considered registered with the league until the player receives his/her player card or a letter of authorization from the BCSA appropriate league. If a coach does not have a card, he cannot remain in the technical area once the game starts. Teams not showing ID cards prior to kick off when requested by match officials to do so must be reported first to the other team as an FYI, then to the appropriate discipline committee as well as the Head Referee at richmondheadref@mindsmith.net once the match has been played. The match will still be played and officiated with the knowledge that this will be reported to the league afterwards. – Trainer or authorized Club official (eg. Club Technical Director). Nobody else is permitted on or in the Bench area. This includes dugouts designed for the players regardless of the weather. If you were the Referee in a scheduled match in which you issued any misconducts (Yellow card/Caution, Red Card/Sendoff or an ejection for Irresponsible Behavior), you MUST log that discipline within 24 hours after the match on the BC Soccer discipline system. If you issued a red card or ejection, you need to know if you keep the ID card and mail it in or if they stay with the team and you simply report the discipline. All officials should have the approved BCSA soccer referee kit set out in the rules and regulations governing Referees in BC. Black is the color of choice for Uniform Jerseys. If a conflict arises, the second choice is Yellow, followed by Red and then Blue. Appropriate black shorts and black socks are to be worn in conjunction with the Jersey. Footwear is to be black with minimal white markings or soles. Tracksuit pants, jackets, or running shoes are not acceptable to wear during matches over top of your uniform. If it is cold, and you receive permission from the Head Referee via an email with details for cold weather gear, then you may follow that directive. IF a toque is acceptable, then it must be black and no other color. Leggings may be permitted but must be black in color and must be worn under the shorts and socks so that it is only visible from the thigh to below the knees. Referees should have 2 whistles with different pitches and tones to avoid confusion when fields are side by side. Referees should have a 2 pen’s or pencil’s, a book/wallet with at least one Red and one Yellow card and a notebook or proper match sheets to record information. Details are only taken in the U13 and up age groups, but Referee’s should get used to carrying it all. Having everything in your kit bag tends to eliminate “Murphy’s Law”. In the event that a match can’t continue through to full regulation time due to darkness, insufficient lighting, field deterioration etc. then you need to abandon the match. Referee fees will be paid full for this game. The Referee has the final decision on suspending matches due to weather or field conditions and it is a non- negotiable decision. Remember Law 5 and player safety regardless of what the players and or coaches want to do. Should any team fail to appear for a scheduled league match or not be able to fulfill a scheduled fixture you will still be paid in full if this happens at the field and or notice is not given by 8am on the match day. The CSA Cast Policy will apply. Prior to the match, any player wearing a cast or who intends to wear a brace or medical support is to be presented for inspection. The Match Official will assess the player’s eligibility to play in accordance with the Laws of the Game (Law 4) and the CSA policies on such things.